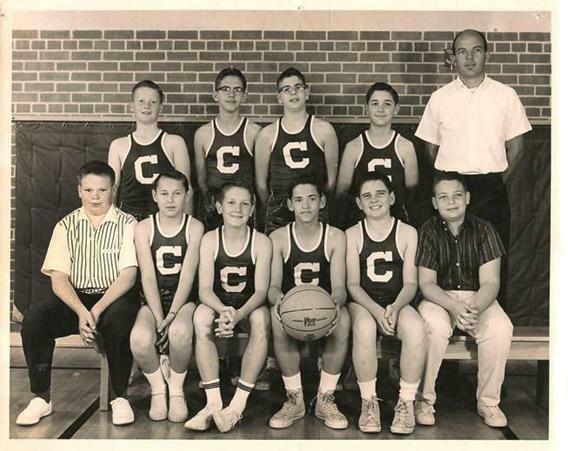 A miserable basketball team, a Nazi classmate, a fateful standardized test: notes on the indignities of the seventh grade. The John W. Carpenter Elementary basketball team. A few months ago I went back to Dallas, Texas to visit my father. He greeted me at the door and told me if there was anything I wanted to keep from around the old place I should pack it up and ship it now. He was 90 years old and blind. My mother, the official caretaker of our past, had passed away five years ago. Dad was certain that if anything happened to him the house would be cleared out and bulldozed before I had a chance to get back to sift through the rubble. The unfortunate flip side of a long life. The joke is, we all know decrepitude and isolation are waiting for us—but only if we’re lucky enough not to die young. It’s the fine print of the writing on the wall. My father’s announcement was not a surprise. I knew that once Mom was gone, our home had officially become a house of cards. It would fall down. Unbeknownst to Dad, for the last five years, each time I’d visited Texas, I’d been packing and shipping everything I knew I couldn’t live without. I shipped back my teddy bear. I had shipped back the clay brontosaurus I made in first grade, the one that looked like it had a thyroid condition. I shipped back the big white family Bible my girlfriend Beth and I kept in our apartment in graduate school at the University of Illinois. We used it to prop open the bedroom window. We didn’t mean to be sacrilegious. A breeze was as good as a blessing on a humid Indian summer night. I had sent back the first piece of music I ever wrote. I found it three years ago in my old piano bench. I wrote it when I was 8 years old. It was talent day in music class and a new student, Claire Richards, who was something of a piano prodigy, played “Pickin’ up Paw Paws” with such verve and joy I knew at that moment I had to be a composer. It didn’t matter that I couldn’t read or write music. I got a piece of manila paper. I got a ruler and a pencil and copied a staff and made an attempt at a treble clef (a sadist came up with that one). I wrote notes down where I thought they looked good. I had titled the piece “Rain Dance.” I shipped it home. My wife Ann had it framed and gave it to me as a birthday present. It hangs in my study. I assured Dad that I had cleared out everything I wanted, and as far as I was concerned, the house was ready for demolition. But for everyone’s piece of mind, I would go back and double check. I went to my bedroom, ready to make short work of whatever odds and ends remained. I looked at my bookshelves where my mother saved my knick-knacks. I determined to make two piles. One for “trash.” One for “treasure.” After an hour of sorting I had nothing in the trash pile. Everything was treasure. I was horrified. Let me be clear, there was absolutely nothing of any real value on my shelves. There was nothing there I had missed or even thought about for decades. This wasn’t even first-tier junk like the dinosaur with a goiter. This was second-tier junk. To my surprise, it was every bit as valuable to me as the things I had already determined were indispensible. For example, I found a little white ceramic book. 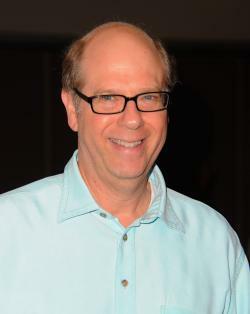 It was open and had my name written on it in gold ink: To Stephen Tobolowsky upon his graduation from Seventh grade. A girl in my class, Connie Ann Moore—her mother, Lulene, bought those books and wrote each student’s name in gold and handed them out at the seventh-grade graduation dance. Mom had saved it. Now it was on my shelf. As it turns out, it was one of my few surviving artifacts of the seventh grade, or what I recalled as one of my most insignificant years. I was 12 years old when I started seventh grade. I was at John W. Carpenter Elementary. In Texas, the seventh grade was the last year of elementary school. Next year we were all going to be shipped out to junior high—to a new school, a big school with three times as many students, all of them with acne. The word on the playground was that everything would be different. In junior high school we would have lockers that actually had locks on them. We would have to wear jock straps without underwear in gym class and worst of all, we would have to takes showers at school with other boys. Barbaric. If you refused you would be cited and given a detention. It meant you had to stay an hour after school. Certain school administrators determined that the reason why some children acted up in school was that they were bored. So in their wisdom they decided to punish them with more boredom. My older brother Paul told me everything I heard was true. He was already in high school. He said the detention halls were huge. Rows upon rows of desks presided over by a “battle axe.” I didn’t know what a battle axe was even in regards to battle. My brother explained they were very old, mean teachers who didn’t say anything and didn’t teach anything. I said that if I ever got a detention I would just do my homework. My brother shook his head, “No, Stevie. Not allowed. You just have to sit there, face forward, hands on your desk and do nothing for an hour.” What? This was crazy. And they thought this was better than spanking? I had always suspected that the adult world was crueler than it pretended to be. Now I was certain of it. With those storm clouds on the horizon I decided to make the best of things. Why worry about an uncertain future when you can use that energy to worry about an uncertain present? Like many kids my age I threw myself into athletics. Who knows? Maybe I would be good. My brother was. Paul was great at every sport. Maybe athletic prowess was part of my yet-to-be-revealed genetic makeup. I played on several teams at Carpenter. In football, I was the kid at the bottom of the pile. In basketball, I was the forward with the bleeding face. This was before the age of specialization, so we had one coach for everything. Coach Hester. He was a trim, athletic man with a larger than average head. He would watch our incompetence day in and day out. He developed a characterological gesture of constantly rubbing his forehead as if he was trying to get rid of the images of our games from his brain. The rubbing didn’t help his already receding hairline. The fact that we were terrible wasn’t all Coach Hester’s fault. A chain is only as strong as its weakest link. I was probably the weakest. I couldn’t run, shoot, or pass. I averaged four points a season. Our team was configured with three guards and two forwards. No one played center. It didn’t matter, no one was over 5 feet tall. Our main offensive weapons were our three guards: John, Wally, and Roy. John was an almost perfect shot from within three feet of the basket. Wally was actually good. Roy had red hair. Coach Hester spent most of our practices drilling them on how to “weave the ball.” This was a combination of dribbling and passing the ball in a figure-eight pattern. It was a beautiful thing to watch. The problem was there was no clear exit strategy. When I said weaving the ball had no clear exit strategy that wasn’t exactly true. I was the exit strategy. After an indeterminate amount of weaving, I was supposed to run to the free throw line. That was the cue to throw me the ball. Then I would hold up one, two, or three fingers to signal to John, Wally, Roy, and the members of the other team, what play we were going to run. It was all academic in that we never had a play. But even if we’d had a play it wouldn’t have mattered. I usually didn’t catch the ball. More often than not it went through my hands and out of bounds or worse, it would hit me in the face. I would start bleeding or crying. I already had two pairs of glasses smashed against my nose by this offense. One game, I ran over to the sidelines and complained to Coach Hester that I thought my nose was broken. He started rubbing his head so hard I thought he would lose his eyebrows. With a minimum of colorful language, he said that I needed to either catch the ball or get a pair of rubber eyeglasses that they sold at local sporting stores for nearsighted basketball players like me. I wasn’t sure that my commitment to the game was great enough to ask Mom and Dad to buy me a pair of rubber glasses. We won two games that year. A miracle. I have to say, losing didn’t bother us that much. We always tried and we never quit. We loved practice. The other boys were fun to be around. The parents were relatively well-behaved. They came to the games every Saturday morning and cheered us on despite the certainty that we would lose. One day after a game, John invited us over to his house for Cokes and sandwiches. We headed over laughing about the beating we just took. We walked into his living room and there on a side table was a large bust of Adolf Hitler with two German flags on the wall above it. There were copies of Storm Trooper magazine laid out on their coffee table as if they were Highlights magazines at the pediatrician’s office. There was something shocking and refreshing that John’s family didn’t feel the need to tidy up after a Bund rally. I am sure they had no idea I was Jewish. It was a question of probability: There were only three Jewish families in Oak Cliff—the suburb we lived in about 25 miles from Dallas. To them I was just “Tobo.” I didn’t say anything about the silent tribute to Hitler nor do I recall any of the other boys saying anything. We just enjoyed the pimento cheese. Then things changed. Somehow John discovered I was Jewish. I found out the hard way when, out of nowhere, he came up behind me and pushed me down a flight of stairs at school. Fortunately, I wasn’t hurt. He walked past me and yelled, “Dirty Jew.” That was a shocker. In arithmetic class I was waiting in line to use the pencil sharpener. John came up behind me and stabbed me in my right buttocks with his pencil. I told him to stop it. I was the same guy. I was Tobo. He looked at me, and tried to stab me again. I grabbed the pencil from his hand and broke it into pieces and threw it away. I looked at him. His eyes blazed—not with hatred, not with joy, but with a strange sense of accomplishment. I expected that this would be the beginning of a long dangerous war between John and myself. But it wasn’t. John left me alone after that. Maybe a teacher talked to him. Maybe he realized I was still Tobo, but I doubt it. The truth was more likely in the realm that we were 12. We were growing and changing so fast, trying on the different skins of the men we wanted to become. In that insignificant year there was another event of great significance. It was another bit of deviltry cooked up by education majors. In what seemed to be a page torn out of the Soviet playbook, the Bureau of Education announced it was going to give a statewide exam to all seventh graders. The grade on this single test would determine your academic path for the rest of your future. If you scored below 110 on the test, you would be put in the big classes with all the troublemakers and the old textbooks. If you scored above 110, you would be put in the smaller classes with the good teachers, with brand new textbooks, and go on field trips. I was unsure of my fate until an assistant from the office came into our class and gave my teacher a slip from our principal, Mr. Moffat. I had been reassigned. My teacher told me to pack up my books and belongings. I remember a couple of boys laughing that I was being sent to the “dumb class.” Almost everyone tried not to make direct eye contact with me. Everyone except Claire Richards. She looked at me steadily and sadly. I was escorted down the hall to my new classroom. 217. I entered into a scene from Lord of the Flies. The room was crowded and noisy. The teacher hadn’t shown up yet. I didn’t blame her. One of the boys was flipping over a desk and laughing at how much noise it made. A couple of girls with giant bouffant hairdos were sitting in a corner chewing gum and talking nonstop. Another couple of kids were running around the room throwing pencils and wads of paper at one another. I cannot adequately describe the shame I felt as I sat at my new desk, which was actually a very old desk that had been drawn and carved upon by several generations of underachieving seventh graders. I studied the hieroglyphics in the wood for secrets of survival. If you want to know what the waste bin of history looks like—it looks something like Room 217. It was a room whose every piece of chalk, every eraser, every desk, and every poster on the wall said, “Welcome to nowhere.” It was a public declaration that there was nothing expected of us and it would be better for everyone involved if we were just warehoused until we could find a job working at a filling station somewhere. Losing never hurt me when I was playing with the Carpenter Crusaders. It was always part of the game. It came with the turf, especially when you played against boys who were already shaving. This wasn’t the same thing. With one slip of paper I was separated from all of my friends and classmates. We had been together since second grade. That was five years. Almost half of my life. I was separated from Claire Richards, the girl I had a crush on since a day in music class when she played the piano and I saw her in her Bluebird outfit with a hole cut in the back of her cap for her ponytail. I didn’t understand what had happened to me. My grade on the test was just at the cut-off to be moved into the honors class with Claire and my other friends. As it turned out, it was a judgment call by our principal. Mr. Moffatt thought since I was “an athlete,” I would appreciate the light workload and expectations that went along with it. (It’s obvious he never came to any of the games.) It was a very Texas way to think. Of course I was never asked what my preference would be. My opinion on the matter was too insignificant to be taken into account. After all, I was only 12. The next day Mom talked to Mr. Moffat. He said he was sorry. He thought he was doing me a favor by lightening my load. But he wasn’t going to change the transfer. He wanted me to give it a chance and see if it worked out. And I did. I used to work on the problems in that math book after I finished my regular homework more out of spite than any desire to learn. And now, almost 50 years later, as I sat on my old bedroom floor looking for trash and treasures, there on the bookshelf—beside the little ceramic graduation keepsake—was the new math text book. Mom had saved it, too. I’m glad. The real lesson of that book was found not on any of its pages but in my mother’s trip downtown to get it for me.